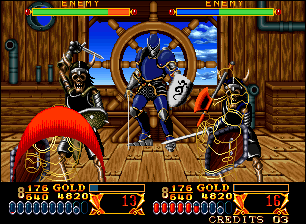 Crossed Swords is one of these completely atypical arcade games, which images seen here and there fuel curiosity. 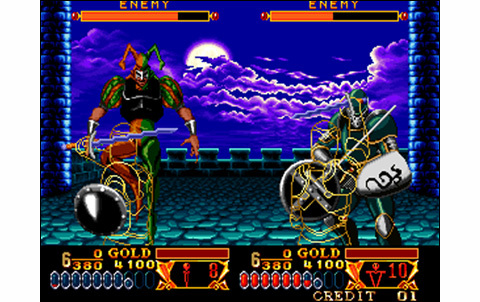 Inaugurated a year earlier with the no less unusual SNK's Super Spy, the 'arcade-FPS' style as it could be named today, features an action that runs a bit like Doom or Quake, with the major difference that the game is made of two-dimensional graphics and almost only allows lateral moves on fixed or slow-scrolling screens. CS proposes to embody two brave knights struggling with the infamous Naussiz and his clique, who spread terror in the kingdom of Belkana. 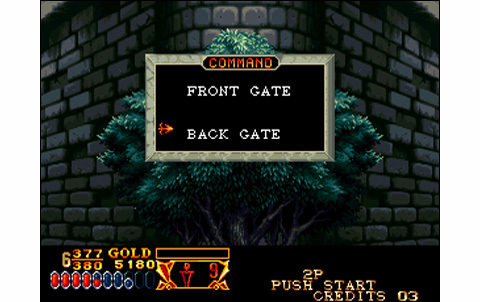 How to Play sequence featuring the fencing master briefs you on techniques you must use to fight properly: guard top or bottom with stick up and down on the stick directions, depending on the height of enemy attacks. Using A or A+down allows you to performs different attacks too. 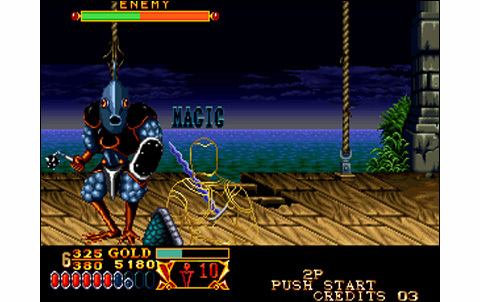 Moving are controlled with left and right, while the B button launches magic attacks. 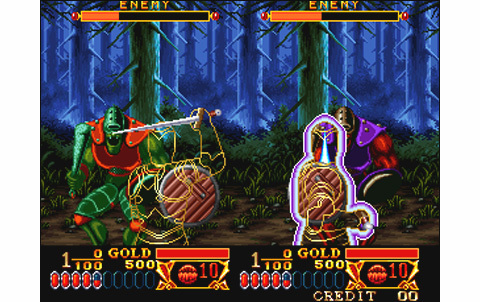 Pressing A+B simultaneously triggers a devastating special move which will drain some life, while the same manipulation operated quickly when you get hit executes a defensive barrier - a sort of counter - that pushes the enemy back. 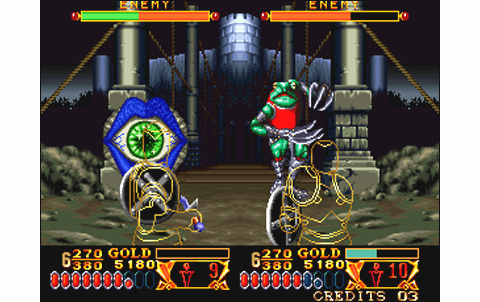 Throughout the action, you are likely to find better weapons and shields with also new magics, which allows varying attacks. It's also possible to play cooperatively, and that's cool! 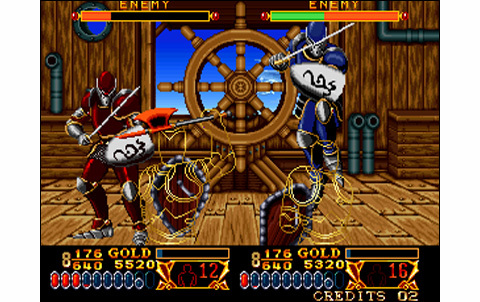 The screen is made of a playground where the combats will occur, featuring enemies' health bars, and also a dashboard displaying health, stamina, level of experience, gold, and the number of available magical attacks. Our heroes are seen in transparency from behind , allowing a good view on the action. 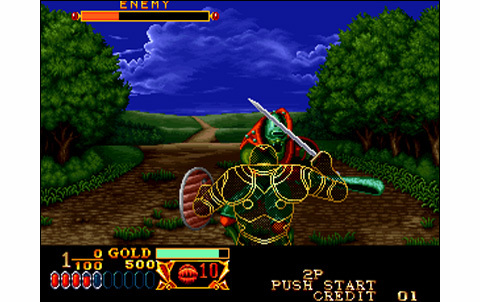 Lateral moves are quite limited on the screen in the strict sense, but still allow evasions. 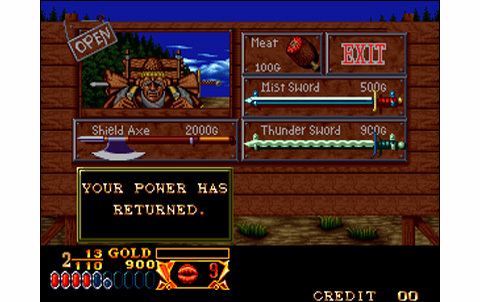 Over the victories, player gets various items like gold, magic or victuals to regain some health. 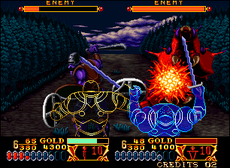 According to the enemies, the strategy varies but in most cases it's about blocking first and then counter attack. 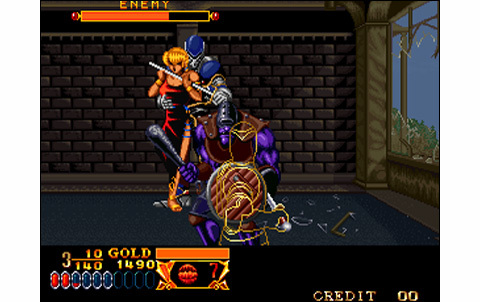 The fights are therefore a bit repetitive, but the game plays on a lot of details to break the monotony. 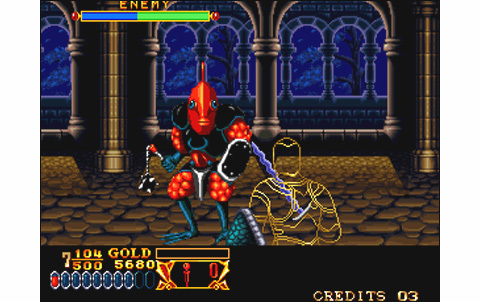 The character gaining experience, the ability to buy better weapons, path selection in certain levels and other goodies, all this make the game taking and give it a nice heroic-fantasy atmophere. 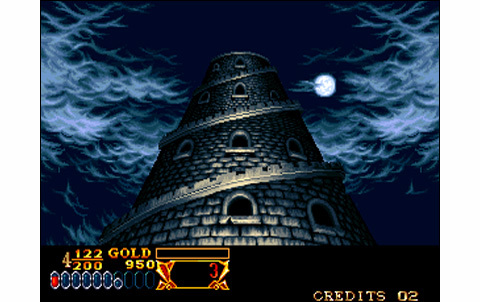 Besides, the realization of Crossed Swords is doing good: the beautiful and medieval backgrounds are not without recalling Magician Lord, alternating beautiful and varied landscapes, caverns and dungeons. 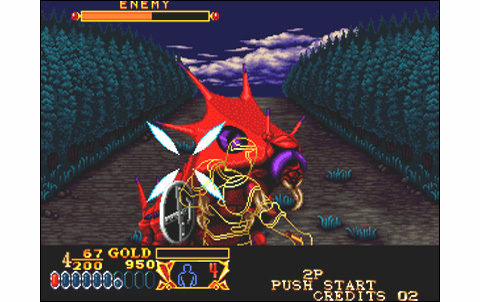 You can't really say the same for enemies, which I counted about ten different species, available in several colors... Bosses are not much more original too, although some - too few - surprises. 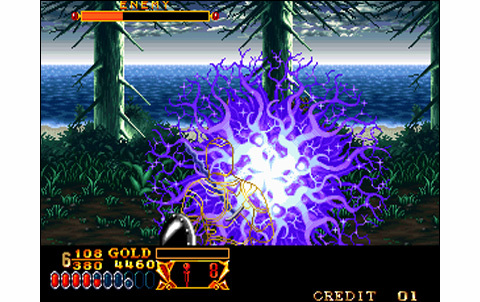 The animation is not bad, with some zooms on the sprites, beautiful explosions and fairly sustained action. 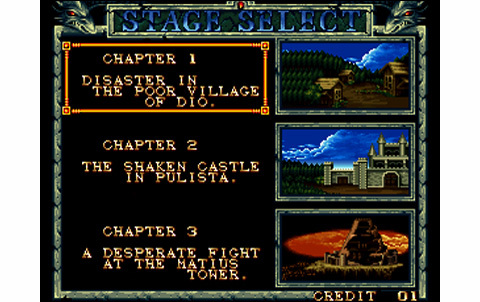 Besides, the decomposition of characters' moves is average. 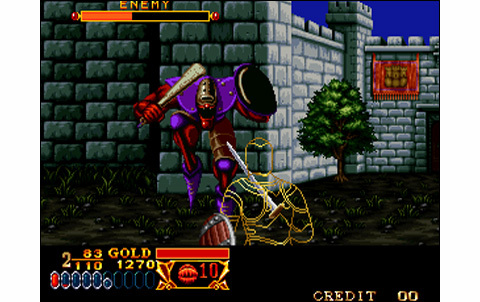 The highlight is probably the soundtrack, with some epic melodies, medieval war themes, and downright creepy ones in later levels. 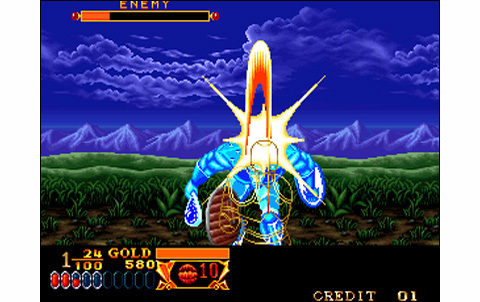 The sound effects are as often on Neo Geo top-quality, with many samples of blades and shields clashing, explosions or cuts very well made. 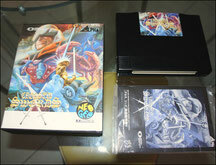 ADK has achieved here a fun and original game, in addition of standing as a real UFO in the videogame world. CS is looking good, long and fun to explore, but is encumbered by two major flaws: its gameplay is rather limited and does not allow a lot of variety, while the action is particularly repetitive, still without being as boring as The Super Spy. 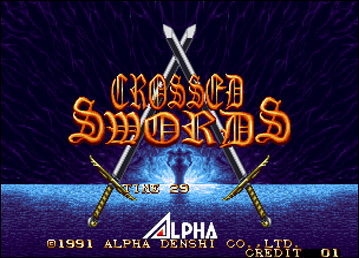 Despite this, Crossed Swords has a special charm and deserves to be discovered, be it probably won't conquer a majority of players. 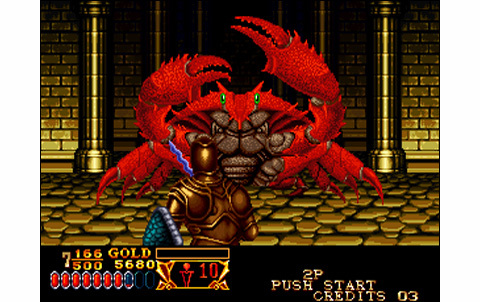 Heroic-fantasy is tangible, with beautiful and varied landscapes, Big Bosses, but enemies are not much varied. Animation is made of scrollings and some zooms on backgrounds and characters. These are decently animated, and the game features good effects during the fights. With musics fitting greatly the action and even creating some stress, there are also convincing effects and a few vocals. 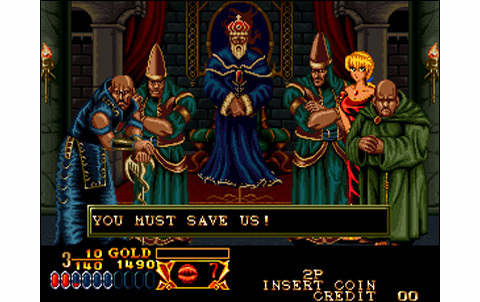 The adventure can be played two simultaneously and last almost one and a half hour, featuring various paths and a good variety of weapons and magic. An original game with a nice realization, unfortunately a little too repetitive and limited that will captivate only few players. Crossed Swords is not stricly speaking an expensive game (40 euros on average) but it's kinda special and repetitive and not everyone would enjoy it... If you want to experiment 2D FPS, it's a good choice, as there are not many.